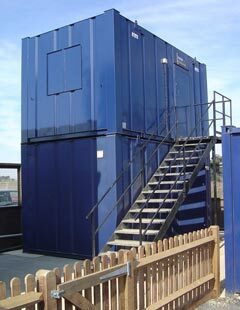 Hiring our units is a very cost effective and flexible way of meeting your requirements. Hire units are particularly useful to help construction site managers meet their duties under health, safety and welfare regulations. See welfare for further details. All units are delivered by experienced and certified drivers. Full risk assessments are available on request (including safe erection of staircases and stacked units). Prior to a planned delivery, we will contact you to confirm all furniture requirements and delivery times. At Portable Space, we have such confidence in our reliable delivery service, that we provide all our customers with a DELIVERY GUARANTEE. If you are not satisfied with our delivery service, we will refund the full cost of delivery or collection. -Contact us to arrange a site visit if you are unsure of any of the above. Hire prices are quoted per week excluding VAT and delivery. View CABIN RANGE View DRAWINGS CALL NOW or E-MAIL US with your requirements.